As most (all?) of you know, we returned in June from living in Moldova for two years. While there, we learned to speak Romanian and Josh taught young men and women who desire to serve the Lord in ministry. We love Moldova and the people there, we love the Romanian language, and Josh loves to teach. Our family at our church in Vatici, Moldova shortly after arriving. Last summer, we had the amazing opportunity to go on vacation in Greece. Driving to Greece from Moldova was like driving to Florida from Kentucky price-wise, and we were able to get great deals and do it on a limited budget. 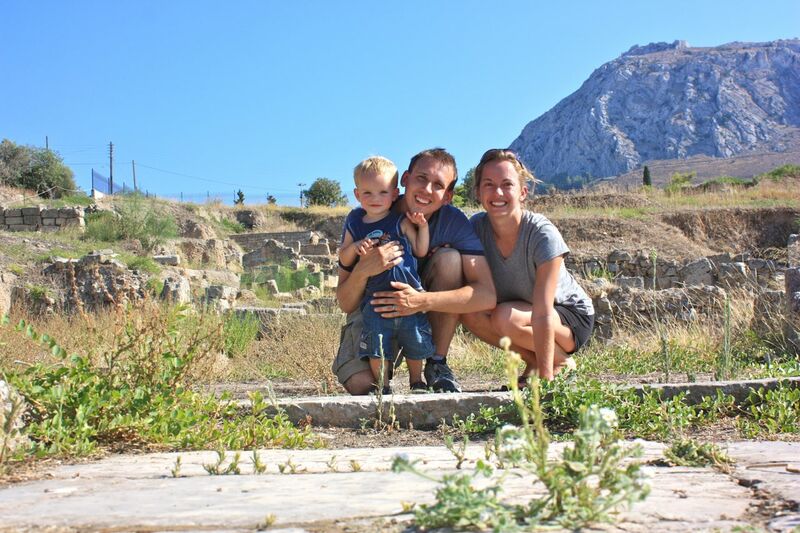 To say that we loved Greece would be a huge understatement. Even while we were there, I began praying that God would bring us back to Greece someday, somehow. One of the biggest highlights of the trip for Josh was seeing the Erastus Inscription in Corinth, Greece. Several weeks ago, a man spoke at our church from Training Leaders International. This organization, in partnership with John Piper's Desiring God, trains local pastors in areas where good theological training is lacking or not available. At this, Josh's ears perked up. That is what he loves. The man said they are planning a trip to Greece in January. Josh leaned in a little closer. We loved Greece. Then he said that the team going to Greece will be training immigrant pastors, some of whom will be Romanian-speakers. I wasn't there (Jude and I were visiting family in western Ky), but I imagine that Josh about fell out of his chair. Teaching pastors... in Greece... in Romanian. Really? Josh immediately desired to go, but took a few days to pray about it, during which the desire only grew. After applying and interviewing, he is officially on the team to travel to Athens, Greece in January. You can read what he has written about it here. Our family in front of the Parthenon in Athens, Greece last summer. Please pray for Josh and the rest of the team-- that they will be able to effectively teach and encourage the local immigrant pastors, that God will be glorified in everything that happens, and that they will have a safe trip. Also pray for Jude and me as we are here without Daddy for two weeks! In many ways, it doesn't make sense for Josh to go. We can't afford it, and, being so close to the holidays, we know that many of you will be spending your hard-earned money buying Christmas gifts, food for holiday gatherings, and maybe paying for travel expenses to spend time with family. But we really do believe that God is calling Josh to do this, so we are trusting that he will provide. Would you, your church, your Sunday school class, or your Bible study group pray about supporting this trip financially? TLI makes it easy to give online, and all gifts are tax deductible. Simply follow this link to Josh's bio (or click on the badge in the right column of either of our blogs) and click "Support This Person." We thank you in advance for any amount, large or small, that the Lord leads you to contribute, and we thank you for your prayers! Josh will post updates on his blog, Gospel Life, so be sure to check in often or subscribe via RSS. I traveled to Greece (Athens!) last April to work with a refugee population that is now residing in downtown Athens. We were able to teach and share the gospel to these sweet people! It is one of my favorite places EVER! I'm going back in apri of 2012 too!!! Exciting! Praying for you and Josh!!!!! !